We welcome all children from 0 – 4 years & love helping them develop their water confidence: from that special first Splash, to their first Kick right through to the all-important first Swim and beyond. Everyone is welcome at Baby Squids! You can start swimming anytime; at any age up to 4 years old, and at any point in the term. Our main aim is to make our baby and pre-school swimming lessons an inclusive, enchanting experience that gives your child vital life skills whilst they are having lots of fun! We are really excited to be starting brand new classes at a private pool in Cranleigh, Surrey from the end of April 2019. Swimming lessons will take place in a lovely warm pool, and there is plenty of free parking. Classes are suitable from birth up to four years old. Our Baby Squids classes specialise in the 0 – 4 year old range, starting with parent and baby swimming lessons, and focusing on building water confidence and safety skills. 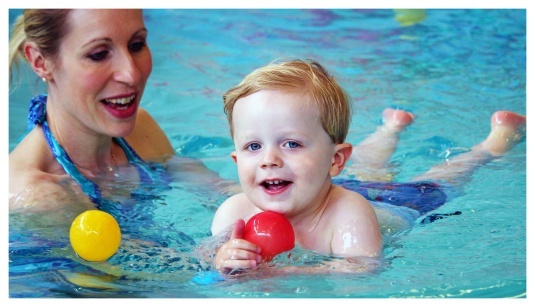 Our toddler swimming lessons help you work with your child towards independent swimming. Most importantly, we have fun while we are doing it! We keep our classes small, so you and your child have plenty of room to learn and play! As we want to make our classes available to all, we work to keep our prices as low as possible. No one enjoys a chilly dip. Our pools are always nice and warm for you and baby! Our teachers are always friendly, professional and LOVE their jobs! A great time to start building confidence in the water. The first year is all about playing, enjoying cuddles and getting used to the movement and feel of the water. Start your swimming journey with Baby Squids and earn awards and badges along the way. Display these proudly as your child goes from taking baby steps, to swimming confidently on their own. Toddlers have so much energy, and kicking about in the water is a great way to build water skills AND tire them out. Win win!! Our fast learning, independent toddlers LOVE the big float, jumping, trying out swimming by themselves, seahorse races on a woggle and learning how to pick up sinkies! With our gentle, fun approach to learning, your child could be swimming by the time they go to school! Build their confidence, and give them the opportunity to learn the all important life skill that is swimming! Want to love what you do? If you are ready to start your own business and want to be running a successful, rewarding swimming teaching company within months, rather than years, the Baby Squids franchise opportunity is perfect for you. Zachary's progress has been unrecognizable. He's developed loads of confidence, loves the swimming lessons and I am so proud of him. Cannot wait until next term starts!